Page 3 news has always attracted attention and so have the numerous star-studded magazines. 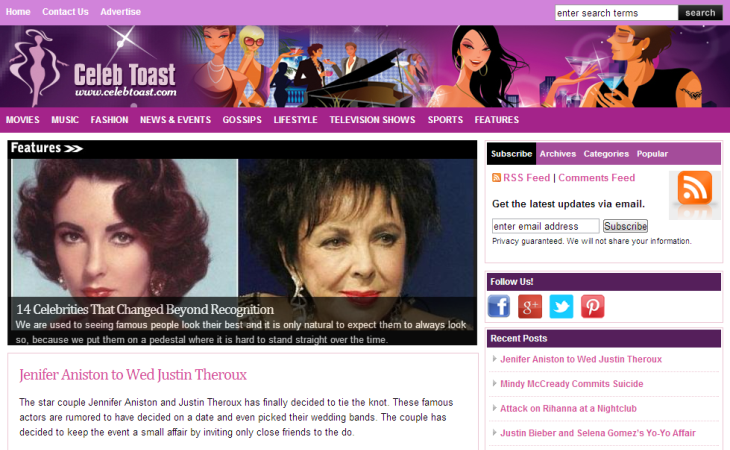 Catering to this segment of readers is celebtoast.com which brings all the celebrity news to one portal. News about celebrities from the bygone era up until the latest is covered in great detail to fulfill the fetish of celeb news mongers. Stars from the movies, music and fashion world are all part of of our listings. Be it the birth of a star child or a high profile wedding drama, we have it all covered. The lifestyle of every known celeb figure has been documented to keep the readers engaged and entertained.